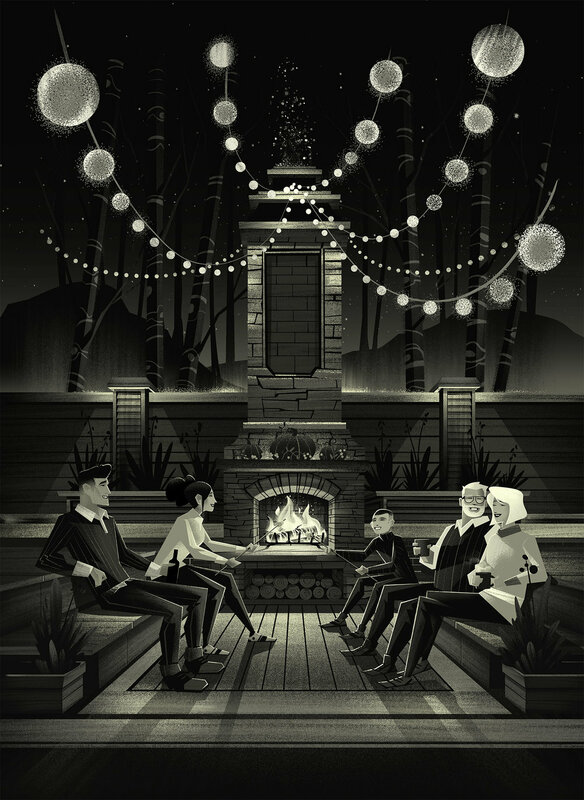 This year I had the great fortune of working on and completing a really fun print series for Oldetowne Landscape Architecture with the fine folks at Tribe, an independent brand design agency located in Frederick, Maryland. Oldetowne worked with Tribe to develop a strategy which would help set their print advertising apart from the industry (which was traditionally photography based). The solution Tribe came up with was exciting: show a series of illustrated seasonal back yard landscapes through a window. This invitational approach would draw viewers in while the illustration would set the ad itself apart. Needless to say with a brief like that, I was thrilled with the opportunity. 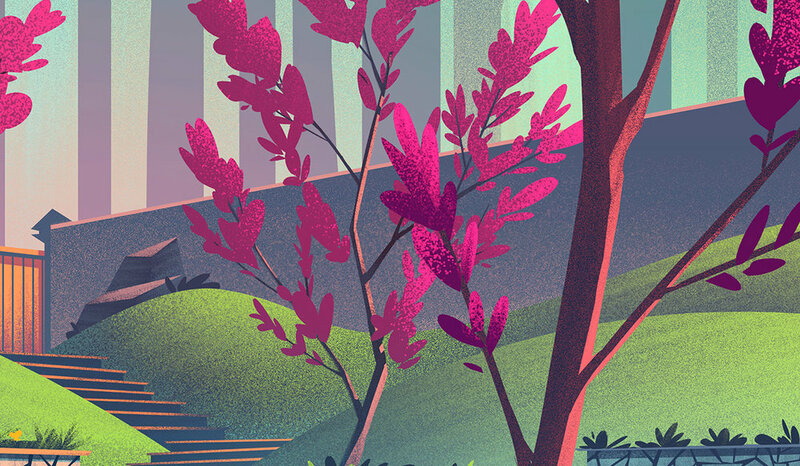 It was also a fun challenge because these outdoor spaces aren't typically as vast as most of my landscape work so I was able to explore depth in new ways - which I'll get into below! The first piece we worked on was the Spring seasonal landscape. With this piece, we wanted to show fresh foliage, newly budding trees, and a quiet moment shared between a couple enjoying a cup of coffee. 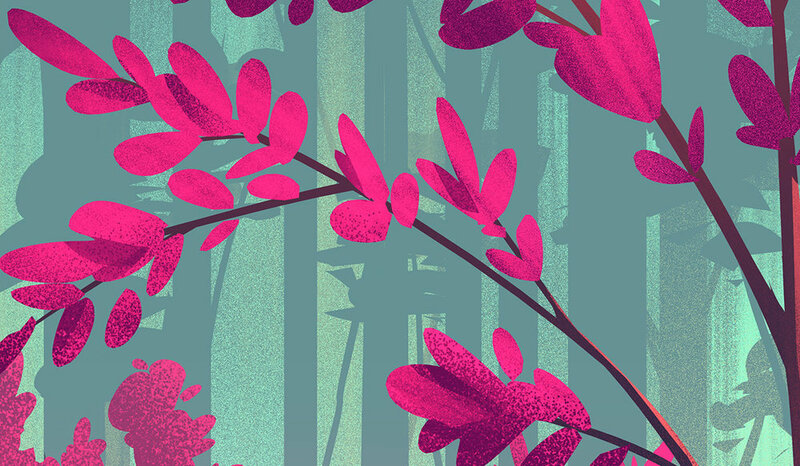 One of the really exciting aspects of these pieces for me was there was no design I was asked to follow for the back yard itself - which meant I got to study Oldetowne's landscape architecture and create based off what they've done (you should really check their work out - it's stunning!). For the sketches of this piece, I opted to work in color since the mood and tone was important to nail down early. I wanted to make sure that the scene was serene and the composition would invite exploration. I utilized the trees in the foreground and background for scale and seasonal hints while the couple enjoyed a quiet moment in their backyard getaway. Once the final illustration was brought to life, I added in the window treatment on top, making sure to leave space at the bottom of the scene for type and branding placement. For the window treatment, we opted to keep it more graphic, creating a simple solution which would still allow the illustration to stand out. The summer piece was one I was really excited to tackle. 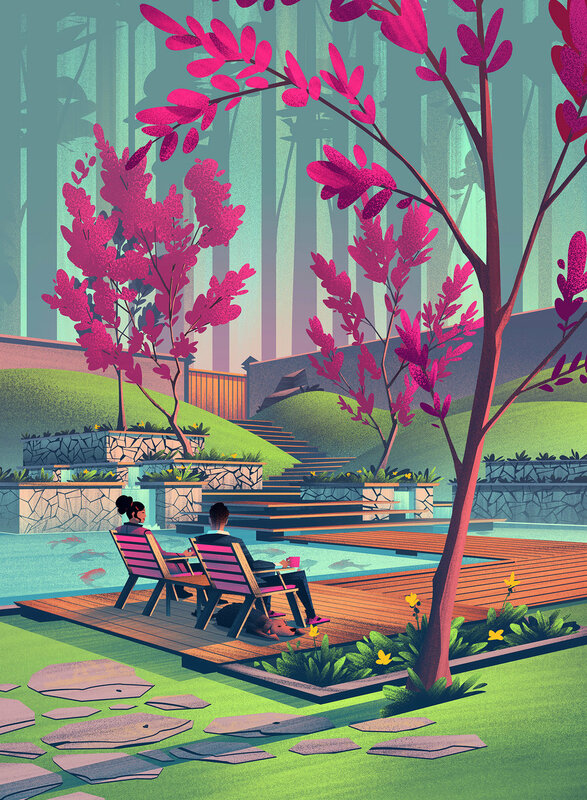 The premise was to show a backyard bbq with neighbors, a pool feature, and an atmosphere where you could feel the heat of summer but find relief in shade and in the water. The sketches for this piece were once again done in color so I could sketch with atmosphere. I knew early on that I wanted to use warm colors everywhere with pockets of shade and cool colors for the pool. I also thought it would be fun to introduce pergola's over the glass sliding door and within the scene itself. In the distance we see other homes as more and more neighbor make their way to the party. 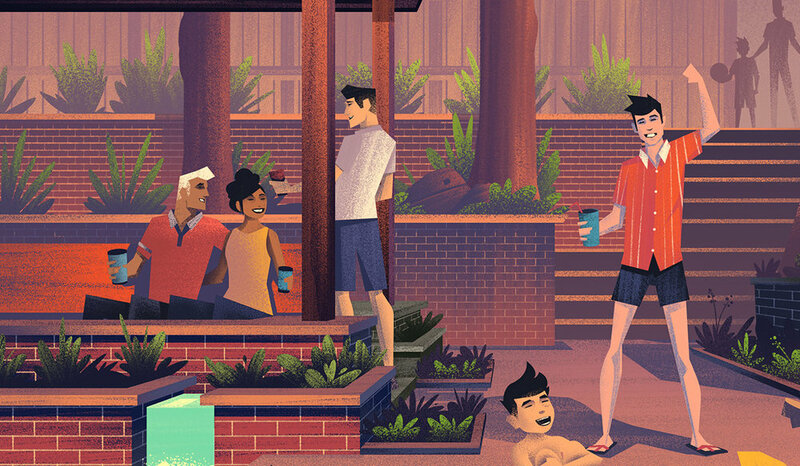 When I work on scenes like this, while I do want the overall composition to tell a story (in this case, 'backyard bbq'), I look for other ways I can inject pockets of narrative within the piece: a man cheering a kid on as he cannonballs into the pool, a conversation between 3 people under the shade of the pergola, a woman expertly seasoning food she's been prepping on the grill, a family looking on as they walk toward the party). Looking for these moments within the illustration creates scenes I want to illustrate, and hopefully pieces viewers delight in exploring. With the Spring piece, I opted to work on the final illustration directly in color while the Summer and Autumn pieces, I worked in black and white values first, then applied color later. I did this simply to explore different working methods based on what I felt like doing. Gotta keep things interesting at all times! With the black and white stage completed, I moved onto color, using my initial color sketch as my guide. All that remained was to place the glass sliding door in front of the scene and with that, the Summer season was complete! Autumn is by far my favorite season of the year and it just so happened to be the last piece in the series. 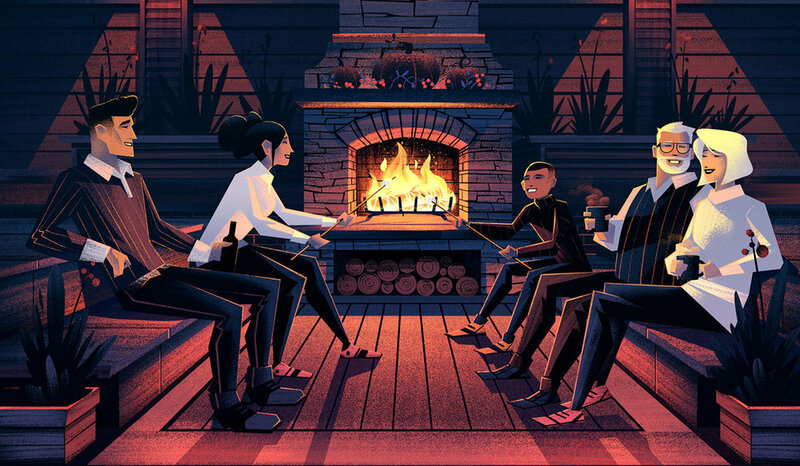 The premise for this piece was simply to show a family enjoying their time together in front of an outdoor fireplace. What I liked too was that the Spring illustration took place in the morning, the Summer piece in the middle of the day, and the Autumn piece in the evening. Everything felt like it had come full circle. I opted to return to my traditional illustration process on this piece (pencil sketches, black and white flats, color) and spent time figuring out how best to show the scene. 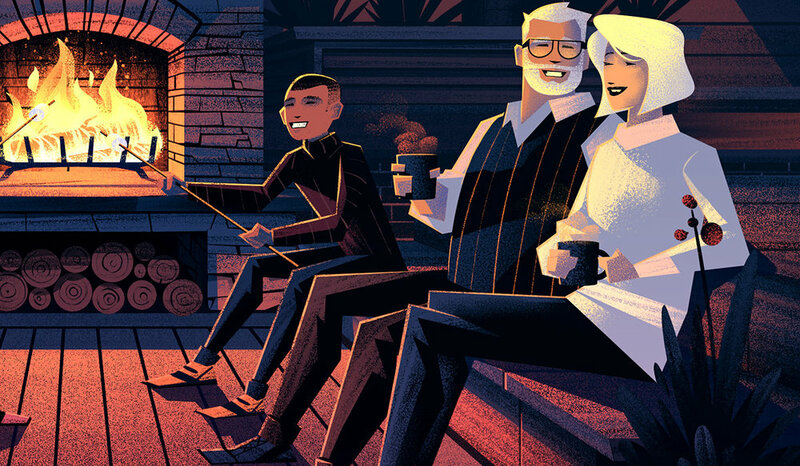 I knew I wanted the fireplace to be the focal point and I thought it would be fun to suspend lights above the family to create a fun atmosphere. It was also a good way to bring in some depth to the piece (which can be challenging to do with a night scene). I always say that if a piece works in black and white, I have more confidence it can work in color. When I was working on the black and white version of this one, I was really getting excited with how things were coming together. I felt like the shapes I was landing on worked well and the lighting worked better than I had anticipated. Adding the color to this one was a lot of fun, especially with the cast lighting from the fire and the light from the string lights. 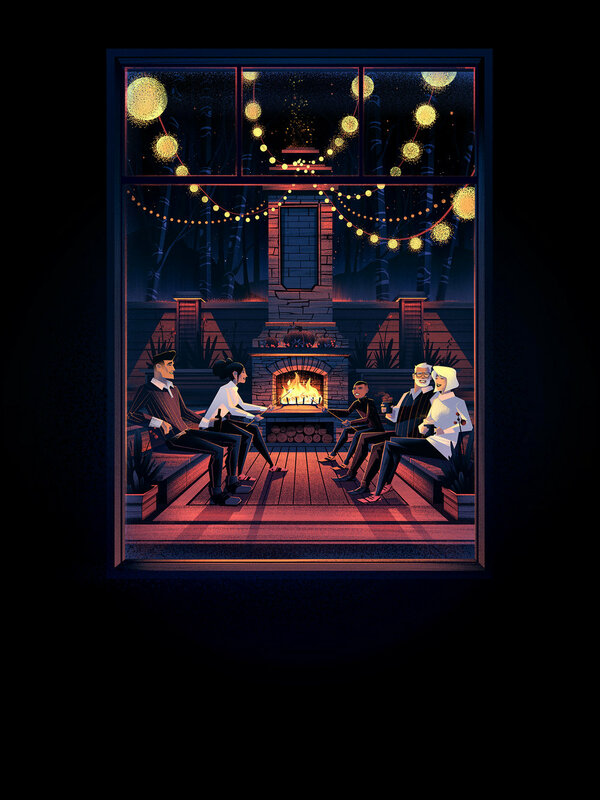 All that was left was to add the window on top of the scene which really helped frame the moment with the family. And with that, my friends, the series is completed! Big thanks to Robby Prall from Tribe for the great direction and oversight. He helped bring this one together big time! And big thanks to the folks at Oldetowne Landscape Architects - I hope my pieces did their landscapes justice. Lastly, thanks to my agent Deborah Wolfe and her staff who work tirelessly behind the scenes to take care of all that needs to happen to make projects like this possible. I truly appreciate it!